In May of 1961, the Martin Institute property was sold at public auction. The home economics building was purchased by Mr. R. J. Kelly. The bus garage and property was purchased by Jefferson City Schools. THe First Baptist Church purchased the old Martin Institute school site to become a parking lot. The old gymnasium was bought by Mr. Ross Maddox of Winder to be torn down and sold as building materials. The Gym property was purchased by Mr. Floyd Hoard of Jefferson. After all was said and done, slightly over $53,000 was brought in by the auction for all the Martin Institute property. Left - Right; Dan Cagle, Earle Tompkins, Julia Stovall and Susan Ethridge. Top Row - L-R; Terry Cotton, Buster Covington, Elizebeth Craig, Charles Crow. Middle Row - L-R; John Davis, Johnny Davis, Sammy Davis, Roger Dixon. Bottom Row - L-R; Betty Edwards, Dennis Elrod, Susan Ethridge and Patsy Evans. Top Row - L-R; Oscar Lee, Steve Looney, Billy McCreery, Jimmy McEver. Middle Row - L-R; Terry Marlow, Dean Massey, Deborah Massey, sara Massey. Bottom Row - L-R; Martha Anglin, Janet Mize, Bobby Joe Murphy and Ellis Murphy. Top Row - L-R; Venell standridge, Jane Stewart, Posy Storey. Second Row - L-R; Neda Stringer, Julia Stovall, Jimmy Tate. Third Row - L-R; Earle Tompkins, Madlyne Venable, Damon West. Bottom Row - L-R; Carolyn Whitlock, Max Whitlock and Claude Wilkes. First Row, L-R; D. Craig, W. Halski, G. Kesler, H. Sauls, B. Mitchell. Second Row, L-R; M. Ragan, P. Hix, L. Perry, M. Garrett, J. L. Whisnant, R. Archer, L. Llewellyn. Third Row, L-R; L. Howington, V. Voyles, S. Dill, J. Nash, E. Berryman, P. Porter, Fourth Row, L-R; D. Wright, C. Brewer, R. Tate, R. Jackson, J. W. Funderburk. First Row, L-R; B. Nix, J. Moore, H. Crumley, C. Pittman, D. Hardy, D. Stover. Second Row, L-R; J. Carter, L. Seabolt, G. A. Moore, S. Payne, M. Huff, M. Dodd, O. Boyd. Third Row, L-R; N. Massey, B. Watson, L. Cole, J. Bond, J. Wilbanks, D. Gilbert, J. Tolbert, B. Pass. Fourth Row, L-R; J. Johnston, J. Venable, S. Duncan, D. Love, J. Ledford, D. Ayers, G. Foster. First Row, L-R; D. Wilson, L. Davis, R. Legg, D. Williamson, J. Shaw, J. Fowler, S. Toney. Second Row, L-R; D. Nix, J. Stowe, B. J. Gaines, M. Hutchins, S. Cooper, M. A. Venable, S. Webb, W. Pearson, Third Row, L-R; J. Love, J. Nelms, J. Ginn, R. Johnson, J. Boswell, R. Pope, H. Carroll. First Row, L-R; T. Geeter, T. Patrick, A. Burnett, R. Johnson, Jerry Nelms, N. Whitsel. Second Row, L-R; M. Thurmond, L. Usry, P. Walden, R. Sheridan, J. Hanson, B. Lavender, J. Brewer. Third Row, L-R; B. Duke, C. Holland, J. Phillips, L. Fletcher, D. Buffington, P. Tolbert, J. Cruce. Fourth Row, L-R; L. Savage, R. Reeves, L. Cole, R. Long, F. Arnold, Johnny Nelms, J. Massey. First Row, L-R; Bobby Freeman, Claude Godfrey, Gerald Standridge, Charles Weldon, Bobby Bailey, Lamar James, Dennis Beatty, Bobby Ray, Tony Beatty, Charles Fuller. 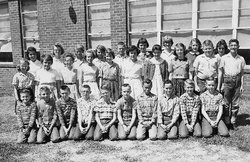 Second Row, L-R; Barbara Roberts, Susan Ayers, Diane Elrod, Angie Garrett, Merita Benson, Chris Garrison, Janice Gooch, Diane Kinney, Herschel Williams, Larry Stewart. Back Row, L-R; Sherry Bulloch, Phillis Webb, Becky Sauls, Brenda Cofield, Terry Tatum, Diane Everette, Sandra Fite, Shirley Johnson and Carolyn Samples. JHS Cheerleaders 1960. First Row, L-R; Posy Storey, Ellen Hall, Susan Ethridge, Brenda Hardy, Lollie Ann Huff. Second Row, L-R; Brenda Ricks, Brenda Samples, Alice Gilbert, Jeanette Nalley. Burton Riddle and Jeff Davis. Waddell, Riddle and Davis accompany football team sponsors at homecoming halftime. Jeff Davis scores one of five touchdowns against Georgia Industrial in a Jefferson win. Burt Riddle grabs a pass for the Dragons. More Dragons action during 1960. The touchdown that was not counted against Commerce in 1960. Score - 0 - 0. 1960 Football awards ~ L-R; Jimmy Sexton, Best Blocker. Jeff Davis, Bill New Memorial Most Valuable Player Award and Best Back Award. 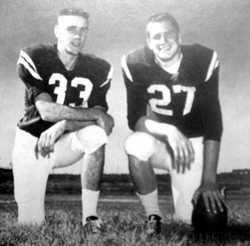 Don Tompkins, Best Defensive Player and Best Spirit Award. George Waddell, Most Valuable Lineman and Best Defensive Lineman Award. Coach John W. Davis. Head football coach and athletic director.